I was fortunate to watch every second of today’s final round of the Open Championship, and I thought it was fantastic. 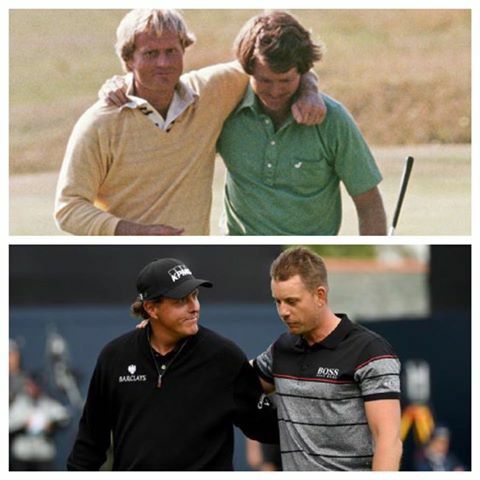 Phil Mickelson played one of the best rounds I have ever seen played in the Open and Henrik Stenson just played better—he played one of the greatest rounds I have ever seen. Phil certainly has nothing to be ashamed of because he played wonderfully. Henrik played well from beginning to end. He drove the ball well; his iron game was great; his short game was wonderful; and his putting was great. Henrik was simply terrific. To win your first major championship is something special in and of itself, but to do it in the fashion Henrik did it in, makes for something very special and incredibly memorable. I’m proud of and happy for Henrik. Some in the media have already tried to compare today’s final round to 1977 at Turnberry, with Tom Watson and me in what they called the “duel in the sun.” I thought we played great and had a wonderful match. On that day, Tom got me, 65-66. Our final round was really good, but theirs was even better. What a great match today.